My sister told me that she had made upma with oats & it was really tasty. I have been thinking of making it myself, since I saw the recipe here. So the next day I went shopping and bought a box of Quaker Old Fashioned Oats. I followed Suganya's recipe for the basics & the rest I did what I usually do, tossed in ingredients that I thought would go with the dish. I made this upma with ghee instead of oil, however that is because upma is not my most favourite food! 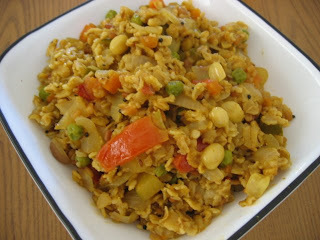 Ghee does give it a nice flavor, but I am sure this upma tastes just as great made with oil. The oats were nice & chewy and the peanuts & dals gave a nice crunch to the dish. Me, a person not known for her like of upma, loved this dish. Oats Upma will now be a regular in my kitchen!